Silver plated. Medium-deep V-cup which allows for a characteristic sound in all registers. Aids in flexibility, clarity of articulation and overall quality of sound. 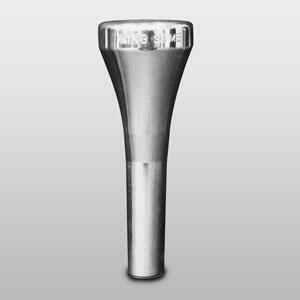 System Blue silver plated mouthpieces facilitate flexibility, clarity and overall quality of sound. Designed to enhance articulation with smoother flexibility, the open throat and backbore help with airflow and sound projection. The mass, cup shape, and rim mold help maintain embouchure position while minimizing minor forced air errors.